It's been an amazing year filled with wonderful people, great press, and participation in special events such as the Pasadena Showcase House, the Hydroponics Conventions, "HomeGrown Culver City", The Beverly Hills High School Garden, and of course, our beloved Farmers Markets and Planting Classes. A definite 2010 highlight was achieving our CCOF Organic Certification in August! 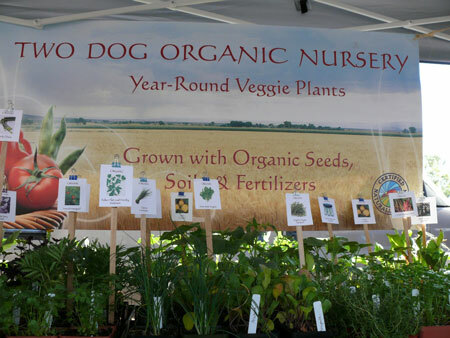 After researching, it seems we are the ONLY Certified Organic All-Edible Nursery in the Los Angeles area. It does require effort and discipline, but we're proud that our customers can trust what we sell. Another important event for us was the 1st Annual Nursery Sale & Holiday Food Drivewhich we held last Sunday. We had a great time! The turn-out and sales were very good, and we collected 150 lbs. of food donations and two hundred dollars for the L.A. Regional Food Bank, which has seen a 62% increase in demand since the beginning of the Great Recession. We look forward to building on these totals at future events! Whew!! This year we offered more than 125 varieties of Organic Seasonal Vegetables, 30 or so Culinary Herbs, more than a dozen Edible Flowers, and 52 varieties of Heirloom Tomatoes! We also sold a ton of Blueberries, Strawberries, and Deciduous & Sub-Tropical Fruit Trees...and the recent addition of Semi-Dwarf Citrus and "Little Cado" Dwarf Avocado Trees proved to be a good idea, indeed! And while we're still in the midst of cool-season crops, our wheels are turning for Spring's New Offerings. 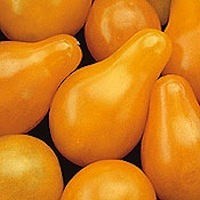 There will be 16 new Heirloom Tomatoes replacing 16 which will bow out for the season. 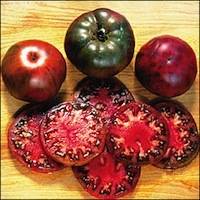 We'll have the big Tomato Page on our website completely updated in January. 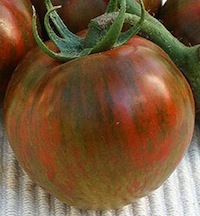 We already have one Tomato order from a customer in upstate New York! We can't even ship her until early May because of her climate, but she wanted to get her order in, just the same! Love the enthusiasm! For those of you whom we met at Showcase House, we're sorry to report that we are not planning to return in 2011. It was a very difficult decision, but it is such a tremendous commitment - one which we don't think we can manage again as we are so much busier now than a year ago. We do hope to participate in other Garden Tour events, though, and will keep you posted as things develop. We're also working on plans to hold an Heirloom Tomato Sale & Food Drive here at the Nursery in early Spring, once again benefiting the L.A. Food Bank. Watch for a date announcement soon! Christmas Day - Market is closed...Merry Christmas! Also, we'll be in town in case you need anything...just call 323-422-3835! NEW PLANTING CLASS SCHEDULE POSTED! The January thru March Planting Class Schedule is now up on the website! We've reached the 1-year anniversary of teaching these Classes, and we still love them. Please join us for one soon...and don't forget, they are a great -and green- way to celebrate a Birthday, Bridal or other special event party! Feel free to contact us with your ideas. That's it for now - except to sincerely wish you all a lovely Holiday Season and a Happy, Healthy New Year...filled with love, joy, and great organic harvests! We thank you from our hearts for all the support, fun, and learning you've brought our way this year, and look forward to even more of the same in 2011! !